It is a joy to welcome one of my favourite Georgian ladies to the salon today. 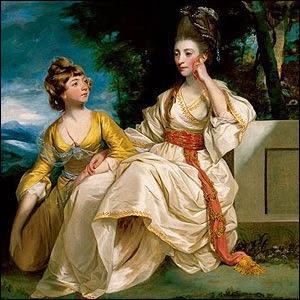 For many years thought of as Dr Johnson's Mrs Thrale, the reputation of Hester Thrale (aka Hester Lynch Piozzi) has been reevaluated of late as her writings and diaries have been devoured by subsequent generations! Hesther was born into privilege as the only daughter of diarist John Salusbury and his wife, Hester. She spent her early childhood in the surroundings of Bodvel Hall, Caernarvonshire, and was a fiercely inquisitive and bright child who immersed herself in writing and literature from an early age. However, for all of their illustrious pedigree, life was not free of concerns for the Salusburys and the free spending of John's mother and brother meant that they were constantly juggling one financial misfortune or another. As John sank into despondency and the family moved to London, he became increasingly volatile until, in a last effort to save the solvency of his name, he departed for Nova Scotia. 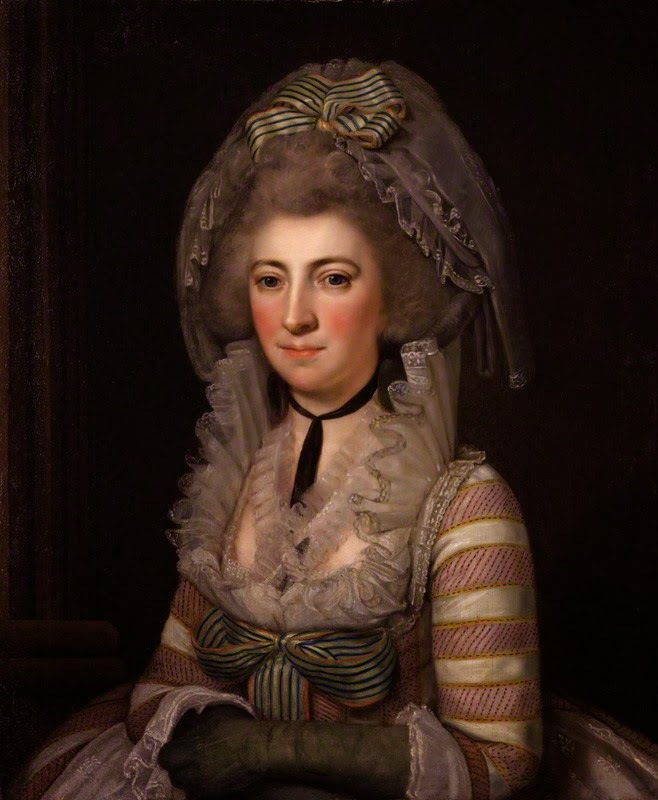 Hester married for the first time on 11th October 1763 when she became the wife of the wealthy Member of Parliament and brewery magnate, Henry Thrale. Although the couple had a dozen children, four of whom survived into adulthood, the marriage was often strained but Thrale's distant behaviour and occasional infidelities. Court gossips whispered that Hester had married beneath her and Thrale seemed ill-suited to court life. However, the couple certainly respected one another and although they might not have shared a storybook romance or blazing passion, they certainly had a deep and abiding affection for one another. Buoyed by her own pedigree and her husband's financial capital, Hester's life became a social whirlwind and she moved in the highest circles, befriending titans of the literary set and enjoying a particularly close friendship with Samuel Johnson, who would later praise her in verse. She counted Fanny Burney among her friends, though this particular relationship would one day be tested by Hester's second marriage. On 4th April 1781 Hester became a widow and an enormously wealthy one at that, inheriting a vast sum of money and the couple's home of Streatham Park. Here she held literary salons attended by luminaries of the cultural world and Johnson had his own quarters there whilst working in the library. She first met musician Gabriel Mario Piozzi at a party in 1777 and was immediately taken by his talent; in the years that followed he often visited Hester to perform for her and by 1782, the widow admitted in her own journals that she was in love with Piozzi, tormented by the knowledge that their social standing was vastly different and that any apparently scandalous behaviour on her part would no doubt percolate down to her children. In fact, Hester attempted to end her burgeoning romance with Piozzi in 1783 yet Hester was so unhappy at his departure that her own daughters had him recalled and on his return, Hester and Johnson exchanged letters in which Johnson's jealousy came to the fore, resulting in an estrangement between the close friends. Finally Piozzi and Hester were married on 25th July 1784 and the couple took up residence at Brynbella, a country house on the edge of Hester's Bach y Graig estate in Wales. She spent the time here in reflection, considering whether it would be possible to lay claim to the lands her father had owned in Canada and eventually resolving her feud with Johnson, just prior to his death. In fact, she went on to publish Anecdotes of the late Samuel Johnson in 1786 and her collected letters in 1788. Hester's historical writings recognised the achievements of women throughout history and she became a noted diarist in the final years of her life. She died in Bristol after a fall and was buried beside Piozzi at Corpus Christi Church, Tremeirchion. What a fantastically romantic story in so many ways! Imagine having daughters who were so concerned for your romantic welfare that they contact your ex lover! But her daughters later reacted against him when they married, and this was always a source of grief to Hester. As you get older though, you realise you have to grasp a chance of happiness even if it involves censure. Interesting. 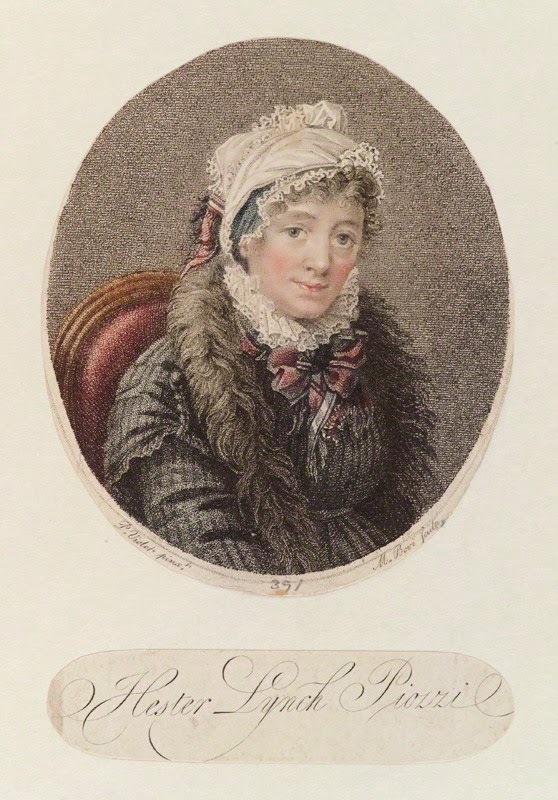 I was first introduced to Mrs. Thrale through Fanny Burney's diaries.